Let your voice be heard! The 2018 Federal Employee Viewpoint Survey is open until June 15 and this year the entire workforce has been asked to participate. Get in there and take this short but incredibly valuable survey. Are you an Army Acquisition Workforce (AAW) member at GS-12 through GS-15 (or broadband equivalent)? Then the Senior Rater Potential Evaluation (SRPE) Phase IV applies to you. Effective for FY18, this expands the mandated SRPE pool to include GS-15s. The SRPE window for FY18 potential evaluations opens on October 1. Additionally, if you anticipate a change in status (i.e., promotion) or change in supervisor prior to October 1, a close-out SRPE is required by July 1, so start planning now. Additional guidance and support can be accessed via our dedicated SRPE website. This is it—the last quarter stretch for Continuous Learning Points (CLPs)! We are approaching the final quarter of the current AAW continuous learning two-year (FY) cycle, which runs Oct. 1, 2016 to Sept. 30, 2018. Keep the push on to hit all 80 CLPs by the end of the cycle. Be sure to review the Continuous Learning Policy for guidance on how to fulfill the continuous learning requirement and ensure each opportunity is recorded on the Individual Development Plan (IDP) to receive credit. Don’t forget that Engineering and Life Cycle Logistics acquisition career fields now have recommended training to complete those CLPs. Coming soon: We are working diligently to ensure the July Army DACM Newsletter is packed full of useful articles and valuable tidbits. Watch for it here: https://asc.army.mil/web/dacm-newsletter/ and don’t miss the latest addition of the award-winning Army AL&T magazine. There’s a new AAW Helpdesk Central Line! For assistance with any of those burning acquisition career questions, call us at 703-664-5740. And as always, feel free to reach out to us at https://asc.army.mil/web/help-desk/. To make your life easier, we’ll be adding new Acquisition Career Model links to the IDP and SPRE tools on June 14 (with pictures too!). 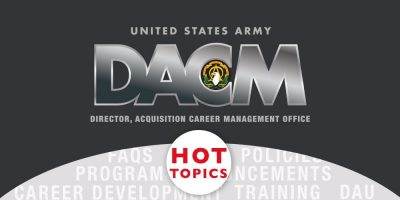 Similar to those used by military members of the AAW, the civilian acquisition career field models provide a career management framework for civilian members of the AAW to fulfill their education, training and experience requirements. There are acquisition career models for each of the 13 acquisition career fields. Check out the newly updated models. The DAU Senior Service College Fellowship 2018-2019 Board results are out—congratulations to all the selectees. 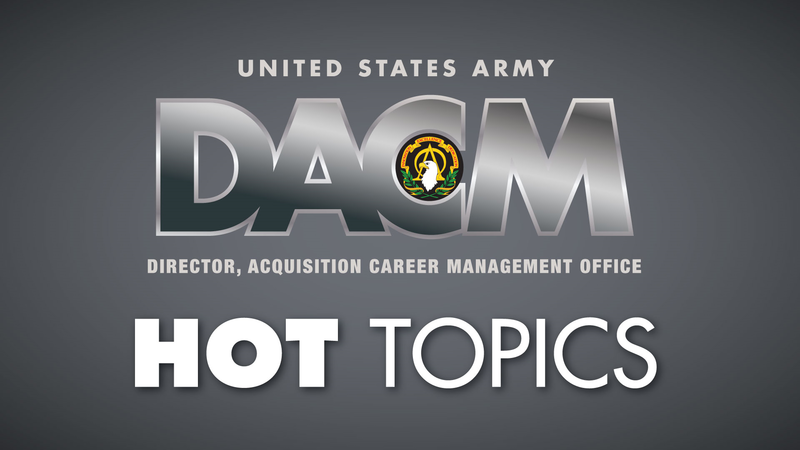 Army Acquisition Tuition Assistance Program education opportunity is open with an application window of May 7–June 13. For additional information on the program, including eligibility requirements and how to apply, go to the ATAP page. The window to apply to the FY20 Project Manager Centralized Selection List closes June 6, and the FY20 Product Manager application window is open June 11–July 26. Information can be found on our Army DACM Office Civilian CSL webpage.